One of the biggest changes in the revamped PGA schedule is the move of the second major of the year, the 2019 PGA Championship, from August to May. That should ramp up the intensity at Bethpage Black when action gets underway on Thursday, May 16. It's the 101st PGA Championship and the hype is sky-high. Fresh off his historic win at the Masters, Tiger Woods will challenge for his fifth Wanamaker Trophy and 16th career major win, which would put him just two away from Jack Nicklaus' 18. 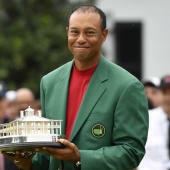 Woods is the 17-2 favorite in the latest 2019 PGA Championship odds, with Dustin Johnson (19-2), Rory McIlroy (19-2), Justin Thomas (13-1), Brooks Koepka (15-1), Jon Rahm (18-1) and Justin Rose (18-1) also going off shorter than 20-1. The 2019 PGA Championship field will be loaded with star-power, and a little advice could go a long way to selecting a winner. Before locking in any 2019 PGA Championship picks of your own, you'll want to see the PGA predictions from SportsLine's golf projection model. Another surprise: Jason Day, a 24-1 long shot, makes a strong run at the title. He has a much better chance to win it all than his odds imply, so he's a target for anyone looking for a huge payday. Day had a career-defining win in the PGA Championship four years ago, his first and only major win. But he has at least one top-five performance in all four majors and finished at least second four times in major play, so he has a proven track record of being near the top of the leaderboard in golf's most prestigious events. Day comes into the PGA Championship 2019 with plenty of momentum after firing an 11-under par at the Masters, good for fifth place. That was his fourth top-five finish this season on tour, which also includes a third place run in the Sentry Tournament of Champions. He's finished inside the top 20 in all but two events he's played in this season and is third in birdie average at 4.83 per round (145 birdies in 30 rounds). With his health issues behind him, Day is a golfer who's capable of climbing the 2019 PGA Championship leaderboard in a hurry.